My last post ended with the train chugging through the night carrying my mom, my twin brother and me to the Golden West. My mother had been granted permission to travel to West Germany to visit her dying guardian aunt. She was allowed to take us with her under the condition that our father stayed back as guarantor for our return. He would be severely punished if we didn’t come back. Although i was dead tired, I fought sleep and attempted to keep my eyes open. I kept my face pressed against the cold, damp train window staring into the dark night waiting for the first glimpse of gold when we entered the west. In spit of my valiant effort to stay awake, I must have dozed off for a while in my mother’s arm. Suddenly the rhythmic clanking sounds of the train rolling over the tracks stopped and the train came to a screeching halt. My brother and I woke up with a startle. Two uniformed conductors entered the dimly lit compartment. My mother handed them some papers, which they studied for a while. Contrary to her nature my mom did not say a word nor did she smile, but sat stock still tightening her grip around us. Without saying a word either, the conductors returned the papers and left the compartment. Shortly after, the train whistle blew, smoke from the engine drifted by the window and the train started rolling through the night again. Suddenly my mom’s face lit up and she began hugging and kissing us exuberantly. “We are in the West now. we are in the West, we are free, we are free,” she repeated over and over again. My brother still half asleep showed no reaction to her expressions of joy. but dropped his head into her lap and continued sleeping. I was completely bewildered. Why didn’t I see any gold? There was not even a star in the sky. Only total darkness. The Golden West we had entered looked exactly like the East we came from. Suddenly it dawned on me that the Golden West was just a figure of speech, a metaphor for something extremely precious and magnificent like gold. Somehow it seemed connected to Freedom. Too tired to ponder this mystery any longer, I snuggled into my mother’s warm arm. I let myself be lulled to sleep by her happy sing song and the rhythmic clanking and rattling sounds of the train carrying us closer to freedom. We arrived at Dortmund at sunrise. At the station we were warmly greeted by my sister’s friends who had escaped to the west a few years earlier. The young couple with their two sons, who were about our age, took us to their small apartment not much bigger than our front room at home in Gotha. After freshening up and having some breakfast my mother told us that we would stay with this kind family for an unspecified time. She would have to see her aunt and then travel immediately to West Berlin, But she and our dad would reunite with us as soon as possible. My brother and I were too dazed and confused by all the recent events that we did not ask many questions. The two friendly boys engaged us into play and shared some chocolate with us, which helped us recover from the strenuous train ride and made us feel welcome. Without making a fuss we kissed our mother good bye. I do not know all the exact details of my parents’ defection to the West. 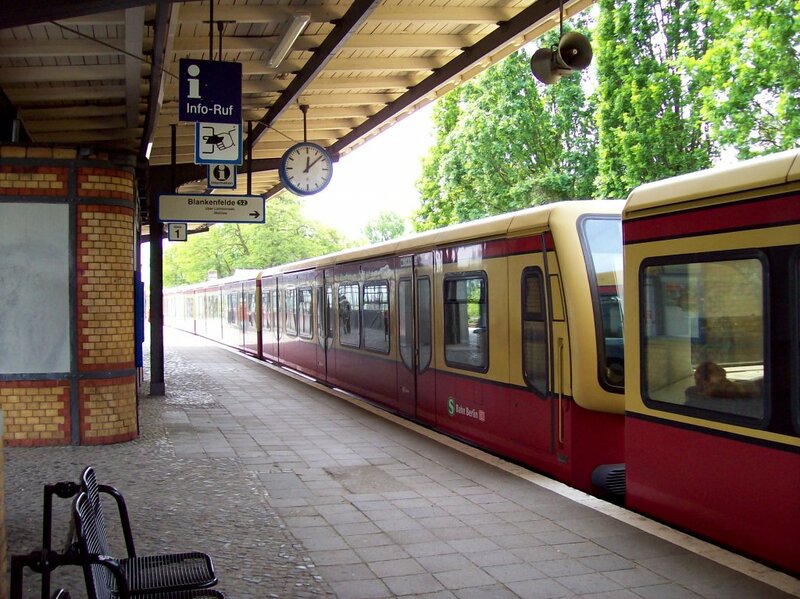 I only know that my mother went by night train to West Berlin where she met up with my father and both asked for political asylum at the Marienfelde refugee camp. 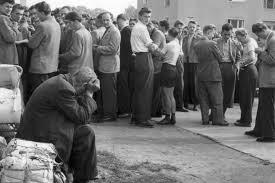 While my mother had traveled with us to Dortmund, my father had traveled to East Berlin where he had relatives. He did not take a suit case. To remain inconspicuous he carried only his leather briefcase with his small portable typewriter and important documents. In East Belin he went on the subway train and quietly left the train at a West Berlin station. At that time the wall did not yet exist and people could escape this way. That’s why the wall eventually was erected. My parents then spent a few weeks at the Marienfelde refugee camp, which processed the flood of asylum seekers from the East. After receiving their refugee status they were then allocated to a refugee camp in northern Germany. Our first year as refugees in this camp will be the topic of my next post.